The new issue of Aperture (#181, Winter 2005) is out. Unfortunately, since I do not subscribe I cannot yet comment on the essay "Lament of the Images: Alfredo Jaar and the Ethics of Representation" by Abigail Solomon-Godeau. I will soon, though - as soon, that is, as I am able to track the issue down in the library here. In the meantime, you should check out Jaar's web page which is exceptionally impressive. I also recommend his amusing "Roland, Susan, David and the Others: A Web Project for Aperture" which comments insightfully on three important "theorists" of photography - Barthes, Sontag and Levi Strauss. You might also be interested in the following interview with Jaar: Patricia Phillips. "The Aesthetics of Witnessing: A Conversation with Alfredo Jaar." Art Journal v. 64 no. 3 (Fall 2005) p. 6-27 . 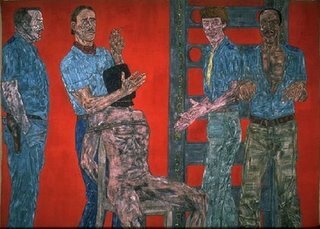 The connection to my last post is that Jaar provided some of the most powerful representations of the Rwandan genocide. Jaar documents his various "Rwanda Projects" in Let There Be Light (Aktar, 1998). "In western Darfur, there is a continuing, and even increasing, level of insecurity both inside and outside the camps. Furthermore, the displaced persons are still subject to ongoing pressure regarding their possible return. At the same time, it's clear that there is no political solution to the conflict." That assessment recently was offered to the United Naitons Security Council by Gabriel Trujillo, Doctors Without Borders/Médecins Sans Frontières' (MSF) program manager in Sudan (October 2005). This is roughly a year after the following prominent photo-essay "Surviving Darfur" by James Nachtwey appeared in Time (October 2004). You can find more pages of photos documenting the genocide and famine imposed by the Sudanese government and its minions on the "non-Arab" African population in Darfur by Marcus Bleasdale for Human Rights Watch from which I have lifted this one. 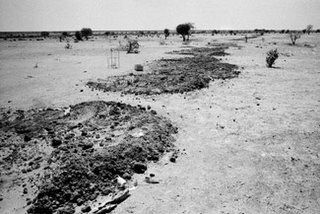 This image (© Marcus Bleasdale) shows mass graves outside the village of Jijira Adi Abbe in Darfur, western Sudan in the aftermath an attack by government troops. According to Human Rights Watch at least 267 civilians were murdered in the attack on this village alone. For insightful analyses of the political-economic sources of the Darfur genocide I recommend a series of essays Eric Reeves has written for Dissent - they appear in the Fall 2004, Winter 2005, and Fall 2005 issues. Since I wrote earlier (1 October 2005) criticizing the policy of embedding journalists and photographers with the troops in Iraq, it is especially nice to be able to link is to a webpage showing the work of photojournalists who have been working in Iraq outside of the official military framework. They are photographers Ghaith Abdul-Ahad (Iraq), Kael Alford (USA), Thorne Anderson (USA), and Rita Leistner (Canada) and video/film-makers Andrew Berends and James Longley. This work breaks through the sanitized war coverage emerging out of the collaboration between our mainstream media and the US Military. They are trying to fund a much larger national touring exhibition. (Information for making financial contributions to the effort is available on the web site.) You also can find their work in a companion volume published by Chelsea Green - the advert page for the book provides brief biographical sketches of the photographers. Urs Stahel is curator at the Fotomuseum Winterthur and delivered this lecture in 2003 on the tenth anniversary of the museum. The lecture is insightful in many ways. Here, though, I want to use it as an example of how discussion of photography too often goes awry, focusing on objects - on photographs - rather than on photography as a technology and the diverse activities and uses into which it enters. How does Stahel answer the quetion in his title? In two ways, one helpful, the other not. His "first," "simple," "concise" reply to the question runs like this: "Photography is a device to record light, invented in the 19th Century (according to current research), that allows us to fix the perspective perception of the world in a manner construed since the Renaissance. Optics and chemistry go hand in hand to create a very efficient means of perception" (6). This is a useful reply, focusing as it does on photography as a technology, an instrument for doing things. From there it is a short enough step to exploring the various uses to which photographic technology is put. But Stahel then feels the urge to "supplement" his initial reply and this is where things - quite literally - begin to overwhelm us. 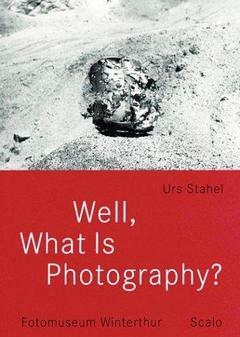 For Stahel is not merely supplementing his view, but changing the subject altogether, from photography to photographs. He is offering a second, much less useful answer to his question. Thus, he compiles a list: "Spatially speaking photographs are ..." and "Temporally speaking they are ..." and "Semiotically speaking photographs are ..." and "Speaking in terms of the theory of perception and epistemology photographs function as a reinforcement of vision" and, finally "speaking in terms of world view - photographs advance ..." (7-8, stress shifted). This list is (at best) a distraction. Fortunately, however, Stahel cannot sustain the impulse. He reverts to the more instrumental view from which he started. "Photography is an instrument for showing things. Most of all photography is probably an instrument for showing things, a device for displaying them" (8). And, once again, we can more easily ask what do we, or others, use photography for? Torture - Who Do You Believe? "The CIA is holding an unknown number of prisoners in secret detention centers abroad. In violation of the Geneva Conventions, it has refused to register those detainees with the International Red Cross or to allow visits by its inspectors. Its prisoners have 'disappeared,' like the victims of some dictatorships." "We do not torture" (or something vaguely like that). Jane Mayer. "A Deadly Interrogation," The New Yorker (14 November 2005). Human Rights Watch. "Torture in Iraq," New York Review of Books (17 November 2005). ever since and is coming to completion in our own day. in some sense, only waiting." - Alexis de Tocqueville Democracy in America. Near the start of his recent book, the ongoing moment, Geoff Dyer admits: "I'm not a photographer. I don't just mean that I am not a professional or a serious photographer, I mean that I don't even own a camera. The only time I take a picture is when tourists ask me to take one of them, with their camera. (These rare works are now dispersed around the world, in private collections, mostly in Japan.) It's a handicap, sure, but it does mean that I come to the medium from a position of some kind of purity. I also have a hunch that not taking photographs is a condition of writing about them ...". Although I myself only very rarely take pictures, I apparently am not as pure as Dyer. A couple of weeks ago I spent the better part of a weekend driving back and forth from Rochester to Ithaca so that I could watch my sons play in lacrosse tournaments. (This turns out to be quite ironic given the origins of the game.) However, I set out, digital Canon firmly in hand, hoping I might capture some of the action. I also thought I might manage to get a shot or two of the small campaign signs that dot the roadsides during our election season. What I soon figured out is that the real politics in the area reflects issues significantly less ephemeral than this or that race for Town Board. The route I took down through the Finger Lakes runs ninety or so miles through Ontario, Seneca, and Cayuga counties. Those Native American place names provide a hint of the conflict, for they mark some of the territories where Tocqueville (summarizing European presumptions) depicts Native populations as just "waiting." At the moment the tribal groupings have laid legal claim to large portions of land from which they were dispossessed by Europeans in the 18th and early 19th centuries. 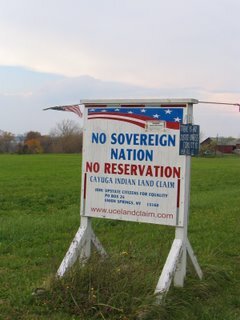 In response some non-Native American property owners have coordinated to contest the court proceedings. The local chapter of one such group - Upstate Citizens for Equality - has erected a large number of signs (not being quantitatively oriented, I did not count them) protesting the challenge to their property rights. The pictures on this post represent a small sampling from the area between Union Springs and Seneca Falls. 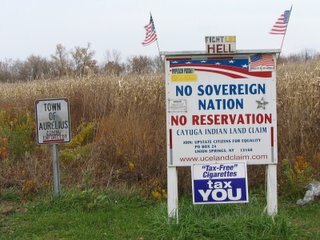 The larger signs are fairly uniform, but are, in different instances festooned with American flags, as well as with smaller signs, some urging a boycott of Native American business enterprises, others warning that vandalism to the signs will be prosecuted vigorously, and so on. 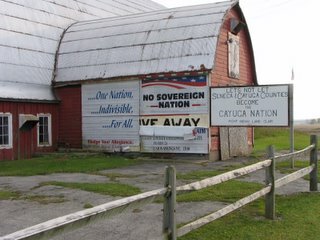 Of course, current property owners in Cayuga and Seneca Counties did not personally drive the Native Americans off their land. But the origins of the property rights to which they cling are hardly clean. If there is "no sovereign nation" as the signs proclaim, there are some obvious reasons why that is the case. 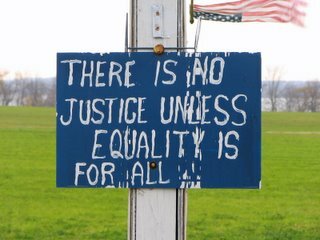 The way forward to - as the signs also proclaim - justice and equality for all cannot come from denying that. This is an incisive essay by Murat Nemet-Nejat - Turkish emigre, poet/translator, resident of Hoboken. It is first, perhaps important to appreciate the credo of the publisher Green Integer: "Essays, Manifestos, Statements, Speeches, Maxims, Epistles, Diaristic Jottings, Narratives, Natural histories, Poems, Plays, Performances, Ramblings, Revelations, and all such ephemera as may appear necessary to bring society into a slight tremolo of confusion and fright at least." I am unsure how Nemet-Najet would categorize his essay given these options. The essay appeared in 2003 and is Nemet-Nejat's response to the exhibition at the Metropolitan Museaum of Art entitled The Waking Dream: Photography's First Century: Selections from the Gilman Paper Company Collection in 1993. Nemet-Nejat confesses that while he had looked forward ot the exhibition, its "initial effect on me was a vague sense of disappointment." He had gone hoping to discern a new medium struggling to invent its own language; instead, he found that even early on, photographers were struggling with received conceptions of "Art." Nemet-Nejat, nonetheless eventually discerns the emergence of three crucial, related dimensions of photographic language, each of which embodies an excess that effaces the photographer and each of which, he thinks, marks a discontinuity with traditonal conceptions of art. First, the ability of the photographic technology to capture light is "unstable," the light emanating from the photographic subject constantly threatens to overwhelm the medium and those who deply it. Second, "the pose" consists in the way subjects present themselves to the camera, thereby initiating a "dialogue" with the viewer that largely by-passes the photographer. Finally, there is the presumed "thereness" of subjects, that they indeed are independent of the photograph and the person who "takes" it. In combination these three dimensions of photographic language mean that: "What is most relevant in a photograph is not what the photographer focuses on, but what he or she ignores. ...[T]his 'ignorance' may be intentional ... or it may be ... accidental. Either way, the center of power of the photograph moves away from its 'focus' to its peripheries." On this view, "the photographer is an intrusion." But, while Nemet-Nejat never makes it entirely clear, both of the first two dimensions he discerns trade upon the third. And this gives rise to a perplexity. Reflected light and the pose of subjects (intentionally?) aimed at creating a direct "dialogue" with eventual viewers, each presume the "thereness" of the photographic subject. In the 20th Century, however, this preumption is challenged by various photographic images that are not "of something" (e.g., Man Ray's "Rayograms"). Photographers consequently were compelled to develop techniques and strategies that could keep "thereness" in question by highlighting photographic reproduction. And this, of course, demanded that they re-assert themselves in order to sustain the conditions under which light and pose might combine to efface the role of the photographer. This is, therefore, a tension in Nemet-Nejat's argument. Regardless of how he might work out that tension, his general theme, that photography is "a medium of democratic meditation" or "reflection" or "contemplation" is persuasive. Here he makes contact with the book by Patrick Maynard about which I posted a few days ago. But in the end, for Nemet-Nejat, photographic reflection operates in the service of inclusiveness. "If photography is the democratic art, it is not because it is mechanially reproducible ... It is because it gives speech to a previously silent multitude." In The Nation this week (14 November 2005), Scott Sherman has a brief essay entitled "Salvador Memories" . The essay is a set of reflections prompted by a retrospective exhibition "El Salvador: Work of 30 Photographers." I saw the exhibit at the International Center for Photography in NYC a few weeks ago and it is powerful both as a document of American intervention in Latin America and as a warning about the tasks of pacification now under way in Iraq. BushCo are pursung the same basic strategy today that the Reagan-ites used in El Salvador in the 1980s. Sherman notes: "Many of these photographs received considerable attention when they were originally published in journals ranging from The New York Times Magazine to Paris Match, and down through the years they have lost none of their ability to shock and incite." He then adds: "El Salvador: Work of Thirty Photographers" takes on new meaning in the shadow of the US war in Iraq. Newsweek reported in January that the Pentagon was considering a "Salvador option" in Iraq, in which Special Forces teams "would advise, support and possibly train Iraqi squads...to target Sunni insurgents and their sympathizers." The US public has largely forgotten the Salvador conflict, but it appears that the Pentagon has not. In this context the show at the ICP is many things: a powerful testimonial to the stoicism and resilience of Salvadorans, whose postwar tribulations are still poorly understood by Americans; a homage to a group of politically conscious photographers who risked their safety to bring us these images (three of the photographers in the show died while reporting from Central America); and a haunting, incontrovertible reminder that the "Salvador option" leads directly to the charnel house"
The exhibition is up at ICP through 27 November 2005. Also of interest in this issue of The Nation is an essay by Stephen Holmes skewering those leftists who supported the BushCo adventure in Iraq. Holmes shows how these folks more or less naively allowed their principles and ideals to blind them to obvious political realities. The result is a political disaster for those hoping to coordinate opposition to the Iraq fiasco. This is a plug for a book that I think is terrific. It is by philosopher Patrick Maynard. His argument is simple and acute - photography is a technology. More specifically, it is a technology for using light to mark surfaces (and this claim is not rendered anachronistic by the digital transformation - read the book and see why). Maynard starts from this view: "Therefore, for the present, we can . . . define photography as . . . a technological family comprising ways of doing things. We can characterize photography in terms of technologies for accomplishing or guiding the production of images on sensitized surfaces by means of light (broadly understood) without necessarily understanding such images as photographs." Maynard seeks, first of all, to dissuade us from starting with pictures or photographs and, instead, to think about photography as a way of marking surfaces, which sometimes produces photographs and sometimes not. The problem with starting with "photographs" is that it generates all sorts of philosophical dead ends. It invites us to reify the subject of our inquiries by focusing on objects instead of activities or practices. Indeed, as Maynard suggests, it invites us to reify two sorts of thing - "on the one side there is 'the photograph' (click); on the other, 'reality' (THUD)." And then it invites us to essentialize one or the other of the sides of that dualism or the relationship between them. As an alternative, Maynard's 'photography as technology' thesis asks us to inquire into what we use photography for. Now it should be clear why I like the book! But the effect here is remarkable. For, while there are plenty of uses of photography, Maynard takes this in an especially intriguing direction. He rightly suggests that technologies amplify our capacities (sometimes by filtering them). He spends a lot of time discussing how photography allows us to amplify our vision and our imagination. In the process he refines our understanding of the 'epistemology' of photography, insisting that this technology allows us to imagine and to do so reflexively, that is, "to imagine seeing things." So we are not captive to some sort of Platonic or Cartesian schema of knowing here. This all seems woefully 'philosophical'; actually Maynard spends much of his time deflating merely philosophical problems. Imagination trades in possibility, in questions about things or states of affairs that, while not currently realized, might prove realizable. Hence the link to politics. If photography allows us to imagine ourselves seeing this or that thing or event, it encourages or invites us to imagine what it might be like, what our responses might be, were we actually to see the thing or event in question. As Maynard remarks: "It seems odd to have to argue not only that technologies of imagining exist but that, economically and politically, these have become some of the most important technologies of modern times." It may be odd, but insofar as politics involves the effort to sustain or subvert the ability of people to envision possibilities, the argument is crucially important too. Revisiting "Without Sanctuary: Lynching Photography in America"
This evening I attended a lecture on campus here by James Allen, the man behind the recent, controversial exhibition of photographs of the lynching of blacks in the United States. You can find the web page for the exhibition here: Without Sanctuary: Lynching Photography in America. Also speaking at the event was Natasha Barnes, Professor of English and of African -American Studies at the University of Illinois -Chicago. In their talks they raised several points that bear repeating. First, photography was integral to these lynchings (which occurred from the 1870's through the 1960s). It was directly implicated in the violence, a component of the events rather than incidental to them. It was not generally part of a journalistic enterprise. People made images of the torture and killing for profit. And people bought the images, often as postcards to send to relatives and friends. So photography did not just capture the ritualized violence involved, it was part of that ritualized violence. Second, during the questions one student asked if there was any connection between the events portrayed in the pictures and events here in Rochester. He seemed blissfully unaware that the technology that allowed the images to be made was intimately linked to Rochester. As James Allen made clear in his remarks, car headlights were used to illuminate the scenes for photographers and, eventually, many particpants could capture the memory of lynching with Kodak brownies. An interesting question - if the Kodak slogan "You press the button, We do the rest!" is accurate, how many Kodak employees spent time developing amatuer photographs of lynching? Or how many of the professional photographers who attended the lynchings used Kodak products in their portable dark rooms? Finally, Allen tried very hard to resist the urge to draw direct links beween the lynching photographs he has discovered and contemporary politics. But, in part, the photographs in his collection are powerful because they help us think not only about the violence they immediately partake in, but to think beyond that to more recent forms of systematic officially sanctioned violence. "So, then, is the real issue not the photographs themselves but what the photographs reveal to have happened to ''suspects'' in American custody? No: the horror of what is shown in the photographs cannot be separated from the horror that the photographs were taken -- with the perpetrators posing, gloating, over their helpless captives. . . . If there is something comparable to what these pictures show it would be some of the photographs of black victims of lynching taken between the 1880's and 1930's, which show Americans grinning beneath the naked mutilated body of a black man or woman hanging behind them from a tree. The lynching photographs were souvenirs of a collective action whose participants felt perfectly justified in what they had done. So are the pictures from Abu Ghraib. The lynching pictures were in the nature of photographs as trophies -- taken by a photographer in order to be collected, stored in albums, displayed. The pictures taken by American soldiers in Abu Ghraib, however, reflect a shift in the use made of pictures -- less objects to be saved than messages to be disseminated, circulated." ("Regarding the Torture of Others," NY Times Magazine, 23 May 2004, pages 26-7). Allen is using the images he has collected to encourage us to think more systematially about cruelty and torture and hatred and dehumanization. For putting these images together and challenging us to face them and the violence they embody we are deeply his debt.